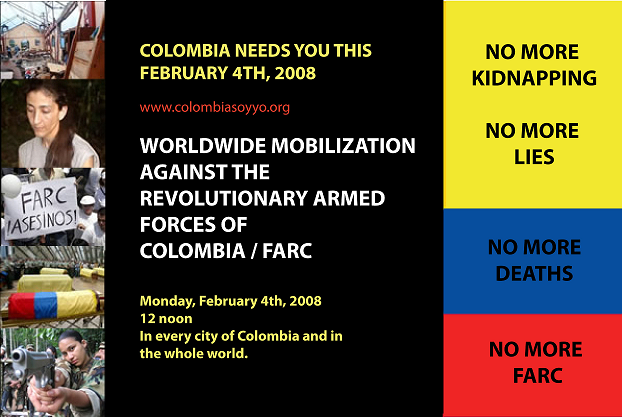 This coming February 4th: join us in the mobilization against FARC. Please join us Monday, February 4 2008 10:30 am at South First and Barton Springs: we will march to City Hall. We march against, and manifest our rejection of all crimes against humanity committed in Colombia over the last five decades by all of the different parties involved in the internal conflict of Colombia . We march for PEACE as long as it is dignified and just. We march for LIBERTY and JUSTICE for all Colombians. This is clearly a mistake. It causes the mobilization to lose its focus. It causes that people identifies them selves with some of the points of the protest but not with others. It dilutes the clear message that started it all: NO MORE FARC. .
I’m glad to inform that the original objective of the mobilization has been reestablish. I like Tim Burton’s movies and this movie is amazing from many aspects, but some how I didn’t enjoyed the movie a whole lot. I can appreciate how well done the movie is, but it didn’t entertain me. Great movie with a magnificent performance by Javier Bardem. Too bad that even after 6 years living in Texas I still had a hard time following the dialogs in the thickest texan accent. Beautiful british movie. Amazing picture. And contains one of the best war scenes I have ever seen. I loved the music and how it blends with the movie. Very refreshing independent movie. I really enjoyed this movie. Made me laugh and had a great time watching it. Three out of these four movies have an Oscar nomination for Best Picture. My vote goes to Atonement. Last night I finished reading the book Skin Tight from Carl Hiassen. I must say that I really enjoyed the book and I have to blame it for a few nights I went to bed later than I should had. The main character is a retired detective Mick Stranahan and someone wants to kill him because of an unresolved crime he investigated years ago. I have to blame my sister Ana Maria for putting this book on my night stand. She told me: “You should read this book, I’m sure you are going to like it”. I was supposed to finish the book in December before she returned back to MedellÃ­n on new years day, but it took me longer than that to finish it. I’m definitely going to look for other books from Hiassen at Half Price Books. If you enjoy this kind of light reading you should give it a try. It is 8:52pm on a monday of 2008 and I just challenged myself to write a post for my blog using a trial version of the application WriteRoom. I read about this application last night on Slashdot when some people were complaining that text editors like Microsoft Word are cluttered with so many user interface (UI) elements that you get really distracted when it comes to write something. On the other hand, this WriteRoom application presents you with the simpler interface on earth: just the text you are writing. These people also argued that when you open Microsoft Word, you feel like you are going to write a school paper and not the next bestseller novel. I think there is some true behind those arguments, but I wanted to try it myself and write a post using this simple application which happens to have a not-so-simple price of U$24.95. I must say that besides the cool factor of writing with a screen that looks like a terminal from the 80’s I don’t really feel a huge difference using it. In fact it is now 9:02pm and these 3 paragraphs is my great contribution to the literature world. Maybe someone who is actually writing a novel and spends hours in front of the screen could really appreciate this tool.